Though I can’t confess to being much of a fan myself, Laurence Stephen Lowry is one of Britain’s best loved and most famous painters, best known for his scenes of life in the industrial districts of Northern England during the early 20th century. He had a distinctive style of painting with human figures often referred to as his “matchstick men”. The above painting is one of his best known works. The original was painted in 1961 as an oil on canvas measures approximately 21″ x 29″. 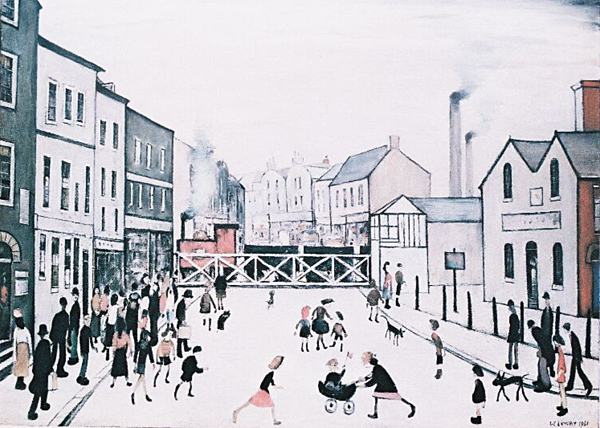 It is one of a number of pictures that Lowry painted in Burton. The picture shows a brewery engine pulling a beer wagon across a the crossing in High Street, Burton, running past the Blue Posts public house and through the gap which now leads to Burton library. Lowry often visited Burton while staying with friends. He liked the town and was partial to a pint of Bass which he maintained didn’t taste the same anywhere else. He produced numerous other sketches of Burton which were eventually published as paintings but not quite as famous as this example simply known as ‘The Crossing’.